New Lompoc Councilmember Gilda Cordova takes the oath after receiving a unanimous vote of appointment. Lompoc lost a seasoned police chief and gained a new City Council member last week. 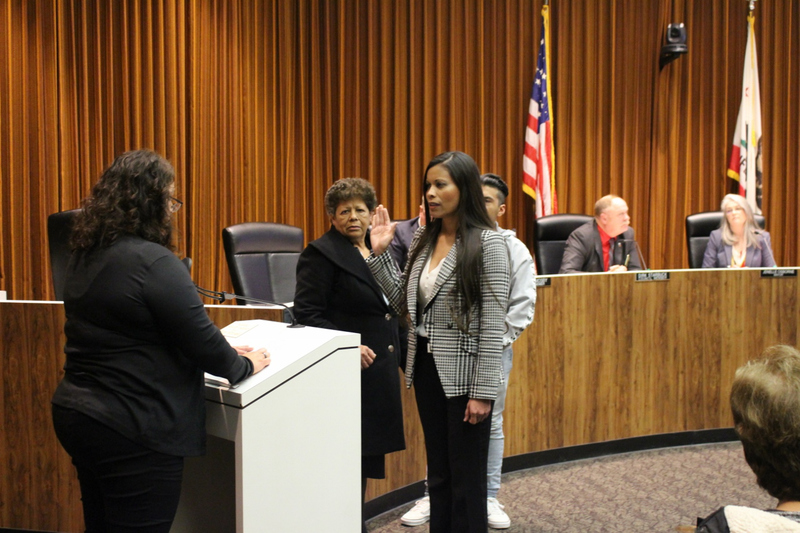 Gilda Cordova was appointed by the council to replace Jenelle Osborne, who became the city’s new mayor. Cordova operates the Holiday Inn Express on North H Street and received 39 out of a possible 40 points from the councilmembers as their preferred candidate from a field of 10. Lompoc Police Chief Pat Walsh, who has headed the department since September 2014, resigned his post, the city announced on January 9, but said he’d remain for a few months until a successor is found. Neither Walsh nor the city gave a reason for his resignation, though the Lompoc Record speculated that Walsh’s discomfort with the city’s pro-cannabis stance could be a factor. Walsh had been with the Los Angeles County Sheriff’s Department since 1984, then moved to Oregon’s Portland Police Bureau in 1991. His education includes a master’s degree from the Naval Postgraduate School, Center for Homeland Defense and Security.